For any more information on availability or booking an event, please call (956) 943-0720 or email: mjacobs@copitx.com or plan a walk through at the Port Isabel Event & Cultural Center, 309 E. Railroad Ave. in Port Isabel. 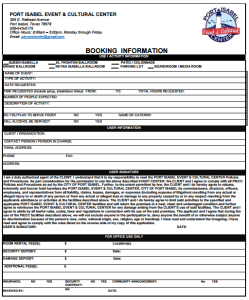 A booking application for rental use must be made in person at the PORT ISABEL EVENT & CULTURAL CENTER (PIECC) office during regular business hours and must be made on the rental contract form provided by the PORT ISABEL EVENT & CULTURAL CENTER and signed by an adult (at least 21 years of age) assuming responsibility for the group. This person must be present during the rental period. No dogs or other pets will be allowed into the facility, with the exception of service animals (i.e., visual impairment, disability). Animal exhibits such as pet shows must be have written permission from the PORT ISABEL EVENT & CULTURAL CENTER Event Coordinator. The PORT ISABEL EVENT & CULTURAL CENTER offers no audio/video equipment. CLIENTS must provide their own audio/video equipment. The PORT ISABEL EVENT & CULTURAL CENTER can provide a listing of “Preferred Audio/Visual Vendors. CLIENT is responsible for own set up and testing of their slideshows, PowerPoint, etc. A reservation becomes official when a nonrefundable $500 security deposit is paid, an application is submitted and a rental agreement contract is signed, and the signed contract is received by the designated due date. Social events (i.e., weddings, Quinceañeras, and class / family reunions) will be booked no more than (2) years in advance. Contracts will be deemed null and void if signed contract is not received (30) thirty days prior to event. A representative of the City of Port Isabel Police Department or the PORT ISABEL EVENT & CULTURAL CENTER Events Coordinator has the right to close a function or expel any individual or group if they are abusing the building policies, or if there exists any conditions or circumstances which are provoking or may tend to provoke a breach of the peace or circumstances which could endanger the health, safety, and well-being of any person or the destruction of property. • If CLIENT requests cancellation prior to final payment, CLIENT WILL NOT receive a refund of the $500 security deposit. payment minus the nonrefundable security deposit. The PORT ISABEL EVENT & CULTURAL CENTER does not provide in-house catering. CLIENTS can choose to have catered food and beverages for their event. The PIECC offers a list of “PREFERRED CATERERS” for the CLIENT to choose from. If CLIENT chooses to hire a non-preferred caterer, the caterer must pay the PORT ISABEL EVENT & CULTURAL CENTER a 10% fee based on gross food and beverage costs (minus sales tax) to CLIENT. No later than (10) ten days prior to the event, all caterers MUST PROVIDE the PORT ISABEL EVENT & CULTURAL CENTER with a copy of their State Food Service Sanitation Certificate, Local Business License, and Certificate of Liability Insurance listing the Port Isabel Event & Cultural Center as additional insured. If alcohol will be present at a function, the CLIENT must meet all obligations of the TABC’s Liquor Laws. NO ALCOHOL SALES may be conducted by the CLIENT. CLIENT agrees to take responsibility for all alcohol served for consumption during the CLIENT’s event at the PORT ISABEL EVENT & CULTURAL CENTER. Failure to hire the required amount of security for the event will result in the forfeiture of CLIENT’s entire Damage Deposit. All children in attendance must remain in the rented rooms with proper supervision. Children are not allowed to remain unsupervised in any area of the building. Children under the age of (13) thirteen are not allowed in the Event Center Kitchen at any time. Deep cleaning is the responsibility of the PORT ISABEL EVENT & CULTURAL CENTER in all rooms, parking lot and outside areas after an event. CLIENT is responsible for leaving facility in “vacuum ready” condition. CLIENT has the right to set up and tear down their event and those fees will be waived. If the CLIENT chooses to complete their own set up or tear down, the responsibility lies on the CLIENT. If CLIENT fails to complete tear down after an event, there will be a charge of $25 per man, per hour and will be billed to the CLIENT. Clean up of CLIENTs decorations are the responsibility of the CLIENT. Dumpsters are provided for all boxes and trash items associated with decorations. Trash items remaining in facility result in an additional clean up fee. Decorations remaining in facility after the event will be disposed of at the discretion of the PORT ISABEL EVENT & CULTURAL CENTER Director. The PORT ISABEL EVENT & CULTURAL CENTER is not responsible for any items remaining after the event. The PORT ISABEL EVENT & CULTURAL CENTER contains many areas that service the whole building and shall not be considered space specific to the CLIENT’s function. These include the lobbies and foyer, all bathrooms, all hallways and all sidewalks. The CLIENT may not use these spaces for any set up, decoration or any other dedicated use for their function without prior arrangement with PORT ISABEL EVENT & CULTURAL CENTER Management. The CLIENT is expected to confine their use to the spaces and within the time limits stated on the contract. The CLIENT also may not obstruct any exits, hallways or stairways by order of the city fire marshal. PIECC, through its concessionaire, reserves the sole right to sell or serve refreshments, including food and confectionary items: the sole right to sell or serve alcoholic beverages, sole right to parking concessions and the right to conduct check stands. CLIENT should not engaged in any such business in the facility unless prior arrangements have been made with PIECC management. CLIENTS, who use the kitchen, should know that it includes a warming oven, sink, refrigerator, cooler, food preparation table, warmers, and ice machine. Cooking, eating and serving utensils along with paper goods are not provided. The CLIENT is responsible for their own safety and the safety of those associated with their event during the installation, display and removal of all decorations. Decorations causing damage to floors, walls or other structures are not permitted. The use of tape, tacks, nails or staples are not permitted in facility. If used there may be additional clean up fees taken out of refundable damage deposit. Candles can be used for decoration only if the candle is in a glass, shatterproof container. Clean up of decorations and trash resulting from decorations is the responsibility of the CLIENT. Basic clean-up is what is provided by the PORT ISABEL EVENT & CULTURAL CENTER. If items are not removed, an additional clean up fees $25/per man /per hour will apply and that amount will be deducted from the damage deposit. CLIENT assumes full financial and legal liability for any damage to any equipment, furnishings, the facility, and premises incurred during the event. CLIENT is required to inspect the facility prior to any event with PORT ISABEL EVENT & CULTURAL CENTER Events Coordinator to assure that any damages were not pre-existing. Deposit will be forfeited if any damages are incurred to PORT ISABEL EVENT & CULTURAL CENTER during rental period. Damages that exceed the deposit will be billed to the CLIENT. CLIENT may be required to provide a valid credit card to be kept on file to cover excessive damages prior to the event. In order to reserve a space, a nonrefundable $500 security deposit must be placed at time of rental agreement. The security deposit will be applied to final bill. A refundable damage deposit in the amount of $500 / $250 is required (30) thirty days prior to event along with FINAL payment. Damage deposits are never applied to fees. The deposit is held to cover any damage or insufficient clean-up resulting from the event. If no damages are incurred and clean-up is satisfactorily completed, the deposit will be refunded approximately (2) two weeks after the event. All room capacities must be adhered to. Any group surpassing slated room capacities will be asked to leave the premises and will forfeit the damage deposit. Events requiring special arrangements must provide a detailed layout of the electrical needs to the Event Center office (30) thirty days prior to the event and will be charged $25 per 10’ X 10’ space for electricity. PORT ISABEL EVENT & CULTURAL CENTER staff must have complete access to all areas throughout the facilities before, during and after all events. A (10) ten foot clearance on both sides of the exit doors, (egress and ingress) with no physical obstruction, must be maintained at all times. No lighted exit sign or accompanying door can be blocked or locked during an event. Full payment is required (30) thirty days prior to the event. The display of firearms requires advance PORT ISABEL EVENT & CULTURAL CENTER approval. Exhibitors displaying approved firearms must comply with all federal, state and local laws governing the possession and/or sale of such. Firearms may not be loaded or fired on the interior or exterior of the PORT ISABEL EVENT & CULTURAL CENTER, including parking areas. Firearms must be deactivated by the removal of the firing pin, the bolt or otherwise altered so it is incapable of being fired (i.e. by a metal lock through the trigger mechanism, a plastic strap securing the trigger or hammer mechanism, a plastic strap securing the firearm’s “action” mechanism in an “open” state or otherwise). Powder or primers are prohibited in the PORT ISABEL EVENT & CULTURAL CENTER. Sample live ammunition may be displayed in exhibits that are kept separate from the firearm exhibit or by exhibitors who do not display firearms. Firearms and ammunition may be inspected by an authorized safety inspector approved by the PORT ISABEL EVENT & CULTURAL CENTER during move-in, show and move-out. Violations must be corrected before an exhibit is allowed to open. CLIENT is assessed any fees associated with such inspection. Any accidents or incidents requiring first aid treatment must have a written report and a copy filed with the PORT ISABEL EVENT & CULTURAL CENTER management office by the close of the event each day. If no report is provided to the PIECC on said day, then the PIECC and the City of Port Isabel shall not be held liable for any personal medical and / or legal fees relating to said incident. Flammable liquids or materials under high pressure are prohibited in the PORT ISABEL EVENT & CULTURAL CENTER. This includes; but is not limited to gasoline, kerosene and propane. Floor plan of event is required of CLIENT for the PORT ISABEL EVENT & CULTURAL CENTER set up staff no later than (10) days prior to event. Changes may be made during an initial set up; if additional changes are required fees will apply. Floor plan shall include tables, chairs, stage, dance area (if applicable), audio/video, food service stations, etc. Any freight delivered before an event must have permission from the PORT ISABEL EVENT & CULTURAL CENTER Director. Any freight left after an event move out date or time will be charged a fee of $100 per day. No items may be hung, attached or suspended from the ceiling unless with prior approval from the PORT ISABEL EVENT & CULTURAL CENTER Events Coordinator. A fee will apply if request is approved. Events must end in accordance with the CLIENTs contracted end time. PORT ISABEL EVENT & CULTURAL CENTER allows (1) one hour after midnight for clean-up and tear down of event. The CLIENT will forfeit one-half of their damage deposit if the finish time is exceeded by more than (30) thirty minutes. Midnight (12:00 a.m.) is the closing hour for the facility and the CLIENT may add an additional (1) one hour to the contract term at $250 per hour if necessary. CLIENT will be billed for additional time required for tear down if damage deposit does not cover completion. PORT ISABEL EVENT & CULTURAL CENTER, at its option, may request CLIENT to obtain insurance at his/hers/its own expense from a company satisfactory to PORT ISABEL EVENT & CULTURAL CENTER against claims for bodily injury or property damage under a policy of general liability insurance each with limits no less than $1,000,000. If requested, CLIENT must furnish a certificate of insurance naming PORT ISABEL EVENT & CULTURAL CENTER, its officers, employees, agents, and contractors as additional insured and forward a copy of said certificate to PORT ISABEL EVENT & CULTURAL CENTER no later than (2) two weeks before the event. The CLIENT and/or its agent(s) hereby agrees to indemnify, hold, harmless, and defend PORT ISABEL EVENT & CULTURAL CENTER and/or it’s public officials, employees, staff, volunteers, servants, and agents, from or against any liability, claim, demand, action, suit, loss, damage, injury, expense, cost, settlement, or judgment for injury, death, or property damage as a result of any action or omission of the CLIENT and/or its guests, invitees, employees, agents, or contractors arising from this agreement or the use of the facilities/premises being rented and/or used, including all costs and reasonable attorney’s fees, and including reimbursement of costs and fees incurred as a result of possible action by the PORT ISABEL EVENT & CULTURAL CENTER to enforce terms of this Indemnity Agreement. CLIENT is responsible for insuring that the event is in compliance with all laws and ordinances, including but not limited to laws relating to the sale, use, or consumptions of alcohol, gaming, and security. The arrangement of music or entertainment is the responsibility of the rental group. Sound level must be suitable for the interior of the rented space. PORT ISABEL Event & CULTURAL CENTER reserves the right to request CLIENTs to adjust the sound level. The Police Department, Fire Department and/or a designated City representative shall have the right to enter the PIECC at any and all times during the event for the purpose of inspection and may terminate any event deemed to be detrimental to the health, safety or welfare of the participants, community or premises. If an event is terminated, CLIENT shall be responsible for any and all costs and shall not be eligible for any reimbursements. Prices are subject to sales tax (8.25%) and (18%) service charge for all events. The PORT ISABEL EVENT & CULTURAL CENTER may require the CLIENT to utilize security guards, chaperones or crowd control for some selected functions. This will be the CLIENT’s responsibility and sole expense. The PORT ISABEL EVENT & CULTURAL CENTER is not responsible for any lost or stolen items, so the CLIENT, their guests and vendors should take reasonable precautions in the protection of their valuables. If overnight security officers are booked, CLIENT is required to provide names and phone numbers of security officers. Lock up of facility will include alarm system setting each evening. Security is required for ALL events. Security guards must be licensed peace officers from the City of Port Isabel Police Department and must be hired for the event and not attending as a guest. It is the responsibility of the CLIENT to hire the security guards, and they must be present at the time alcohol is served. There will be a fee of $30/per hour, per security officer. A copy of the contract between the PORT ISABEL POLICE DEPT. and the CLIENT must be on file (10) ten days prior to the date of the event. CLIENT is responsible for the set up and removal of any equipment, including catering equipment, bar set-ups, rented equipment from another company, musical equipment, and any decorations used within the rental period. Tables and chairs that belong to PORT ISABEL EVENT & CULTURAL CENTER will be set up for the CLIENT prior to the event. Cleanup of all trash is the responsibility of the CLIENT and must be placed in trash bags at the end of the rental period. It is also very important that the CLIENT makes arrangements to be out of the building at the pre-set rental time. This also includes any entertainment, bartenders, decorators, caterers, etc. that have been hired by the CLIENT. Failure to do so may result in additional fees. PORT ISABEL EVENT & CULTURAL CENTER staff will be on site during the rental period. Delivery trucks may only use the entrance at the back of the building and may not use the front entrance. No exceptions. PORT ISABEL EVENT & CULTURAL CENTER staff will assist in table and chair set up and removal only when using the tables and chairs provided by the PORT ISABEL EVENT & CULTURAL CENTER. Portable stage is available to use for an additional set up fee of $250. Each section is 6 foot x 8 foot x 24” with a black non-skid surface. The stage also has a set of steps and black skirting. The PORT ISABEL EVENT & CULTURAL CENTER Events Coordinator must be notified prior to the event if the stage is needed; and payment for the stage will be due (30) days prior to the event. Arrangements for the layout of the tables, chairs, and stage need to be made at least (30) days prior to the event with the PORT ISABEL EVENT & CULTURAL CENTER Events Coordinator. If CLIENT chooses to use tables and chairs other than the ones provided by the PORT ISABEL EVENT & CULTURAL CENTER , an additional labor and storage fee up to $1,000 will be charged and will be due (30) thirty days prior to the event. When using tables and chairs that are not provided by the PORT ISABEL EVENT & CULTURAL CENTER, it is the responsibility of the CLIENT to set them up and remove them at the end of the rental period. All personal items, equipment, decorations, food, catering supplies, bar set-ups, etc., need to be removed immediately after the event, unless prior arrangements have been made and approved by the PORT ISABEL EVENT & CULTURAL CENTER management. Any special arrangements for set-up and removal of items need to be arranged prior to the event with the PORT ISABEL EVENT & CULTURAL CENTER Events Coordinator for approval. An hourly fee of $250 dollars an hour may be required if additional rental time is needed. It is the responsibility of the CLIENT to remove all trash and used items at the end of the rental period, and to respectfully leave the premises without excessive clean up required. This includes all trash on tables, kitchen, bridal and groom suites, and any trash left in outdoor areas. The CLIENT is not required to sweep, mop, clean bathrooms, or do any type of heavy janitorial cleaning. All trash must be placed in heavy-duty trash bags provided by the PORT ISABEL EVENT & CULTURAL CENTER and liquids should be disposed of before putting in trash bags. Caterers are responsible for their own clean-up and removal of their equipment and trash at the end of the CLIENT’s rental period. If this is not done, it is the responsibility of the CLIENT. Excessive clean-up will result in the forfeiture of the CLIENT’s entire damage deposit. Banners, posters or signs are prohibited from being adhered to the inside or outside walls. The use of adhesive, tape, pushpins, nails, staples, etc. is strictly prohibited. All outside banners must be approved and displayed by PORT ISABEL EVENT & CULTURAL CENTER staff at a nominal fee. Smoking is prohibited in all common areas of the PORT ISABEL EVENT & CULTURAL CENTER, including bathrooms, hallways, lobbies and courtyard. Designated areas are in place for smoking and are located at entrance areas of building. The CLIENT must work with the PORT ISABEL EVENT & CULTURAL CENTER staff to make sure that their function does not impede or intrude upon other functions occurring in the center. If amplified music or sound reinforcement are used for a function, it will be subject to sound pressure levels requested by the PORT ISABEL EVENT & CULTURAL CENTER staff. The CLIENT and their vendors agree to abide by the decisions of the PORT ISABEL EVENT & CULTURAL CENTER staff to determine levels acceptable to all in the PORT ISABEL EVENT & CULTURAL CENTER. The adult sponsoring the event must be (21) twenty-one years of age or older and assumes liability for any damages incurred in conjunction with the event. Weekend events (i.e. Proms, School Competitions) for groups of teens under the age of (21) twenty-one must end by 12:00 a.m. (midnight). Security officers will be required for ALL Youth Events and must be present during the entire event (at the CLIENT’s expense). NO ALCOHOL will be permitted during any Youth Events. I, the undersigned, as the CLIENT of the PORT ISABEL EVENT & CULTURAL CENTER, do hereby acknowledge that all information contained within this contract and policies is agreed upon. I have read, understood and will abide by the by said contract set forth by the PORT ISABEL EVENT & CULTURAL CENTER. I have received a copy of the PORT ISABEL EVENT & CULTURAL CENTER Contract and Policy Agreement. This AGREEMENT made this _____ day of ___________________, 20____, by and between ____________________ (herein referred to as “CLIENT”) and the City of Port Isabel, Texas (herein referred to as “CITY”,) doing business as the PORT ISABEL EVENT & CULTURAL CENTER . NOW THEREFORE, in consideration of the above, CLIENT agrees to release, indemnify and hold harmless the CITY from any and all claims, including costs and attorney’s fees incurred by the CITY in defense of such claims, that may arise as a direct result of activities held by CLIENT and CLIENT’S participants during the duration of the event for which this permit is issued. IN WITNESS WHEREOF, the parties have executed this AGREEMENT, including any addendum s attached hereto, on the date and year first written herein.